I learned about this set several weeks ago when the entire series was posted to the Trading Card Database and yesterday I was able to find a pack for myself. I have to admit, this may be one of the best packs of cards I've ever opened! 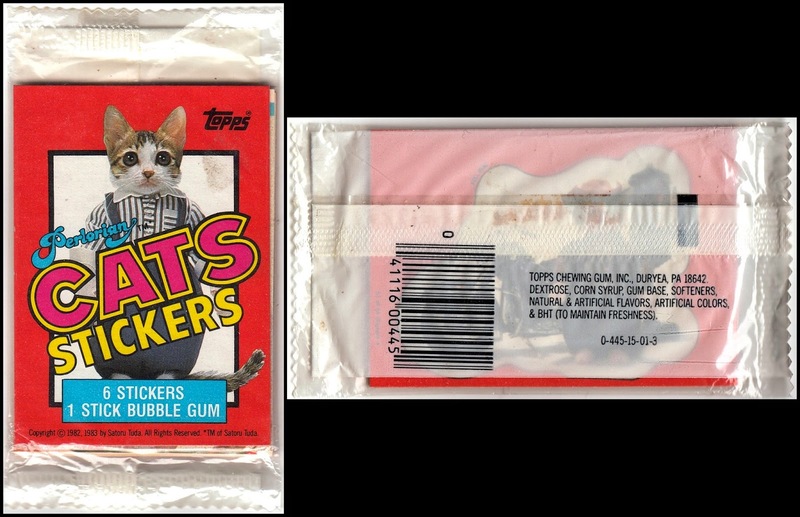 They come in a clear pack, which has yellowed in it's 32 years of existence. I suspect the cover card came in every pack. On the back of the cover card, which is not numbered as part of the set and is the only actual trading card, is a poster offer. I kind of wish that the offer was still good. Maybe I should write to the PO Box and see if they still have any? Not sure what I would do with them, though. A cat ironing what appears to be a human sized bikini? There is some damage on this card due to the gum sitting on top of it for 33 years. Look, one of the images available as a poster! 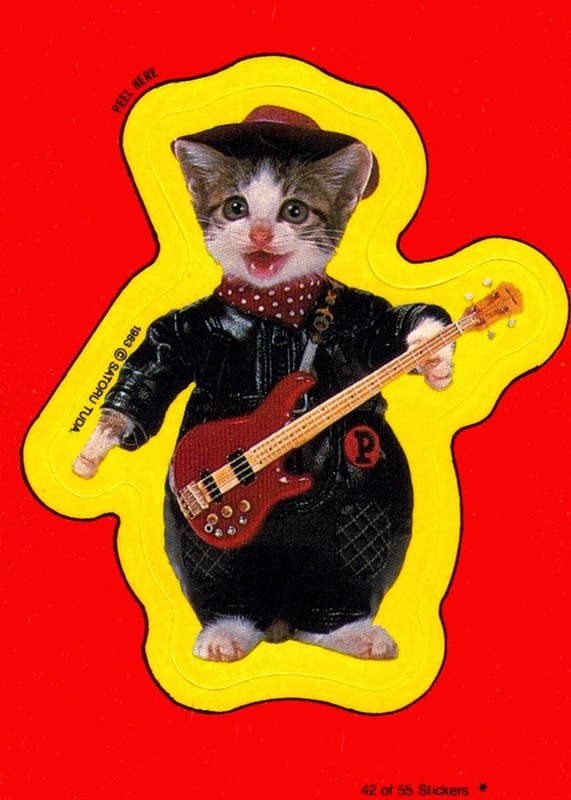 Personally, I think I would rather have had the ironing cat as a poster. Just because it's so bizarrely awesome. I'm not really sure what's happening here. I suspect the cat on the right is getting ready to eat whatever is in the cart. I thought at first it was a rat, but after scanning it, and seeing it larger, I think it may be a small pig? 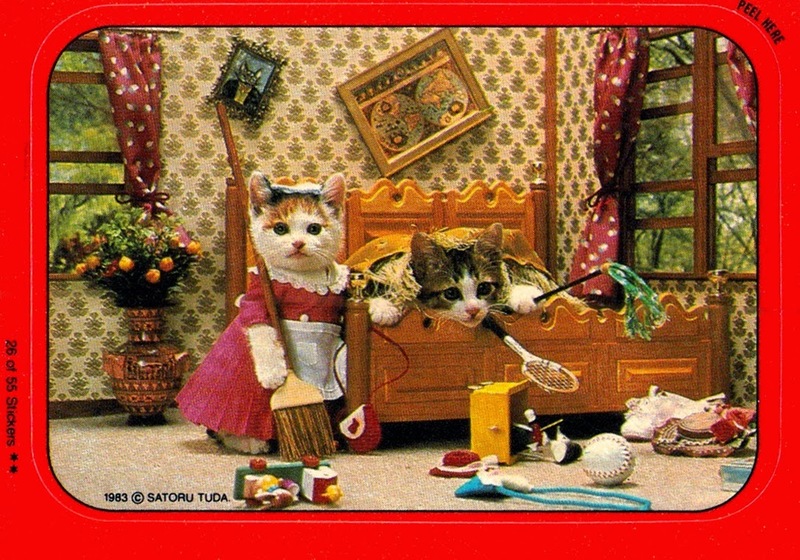 And why is the cat on the left wearing a bucket on it's head? What year was Devo's "Whip it" released? 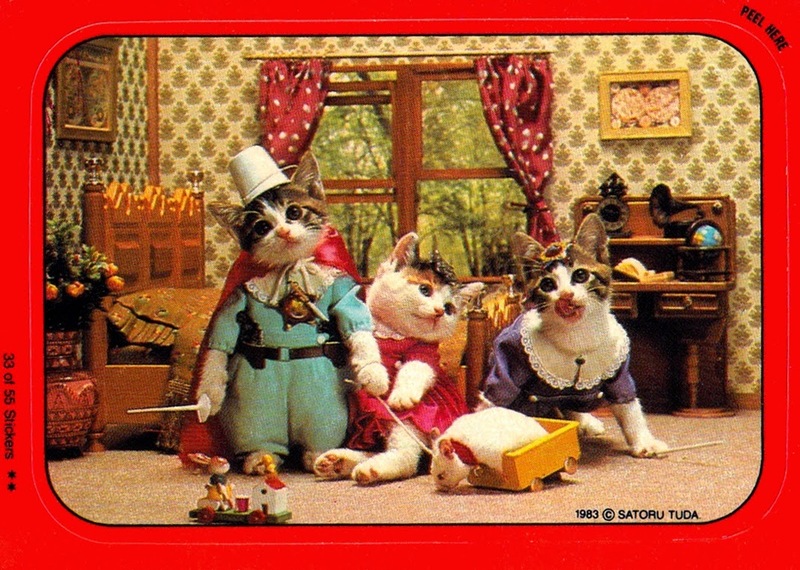 Note that the cat on the left carries two guns and a sword, as well. 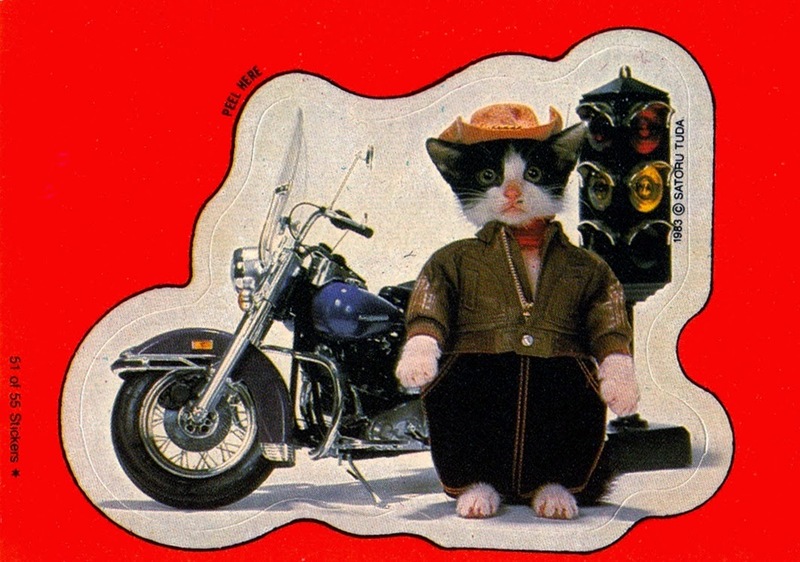 You don't want to mess with this cat. Oh yes, I scanned the gum! It's essentially petrified and the bottom left corner has broken off. I taped it shut inside a penny sleeve. And I counted it as part of my collection! Because that's just the kind of thing I do! I have no idea where the name Perlorian came from. It's clearly got a logo, but the cards are copyrighted to Satoru Tuda. I hope to find more of these at some point, the dealer I got this pack from had only one. It was well worth the $2 I spent on it. 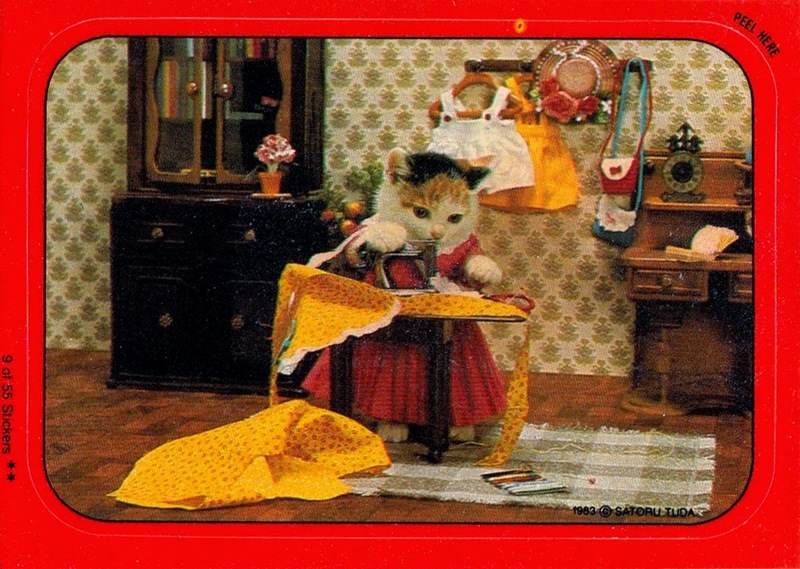 You always see at the end of the movies, "No animals were harmed in the making of this movie"...but I wonder, how many cat dressers were harmed in the making of these photographs? I imagine more than a few! Wow those are fabulously weird! Great post! 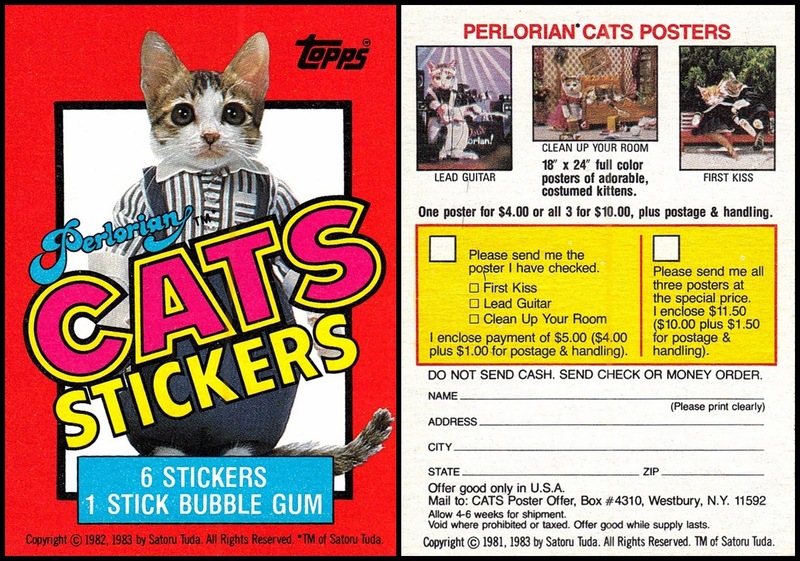 Hobby Market missed opportunity #463: Combining the licenses of this set and a TV show to make "Topps ALF Eats Perlorian Cats" set. 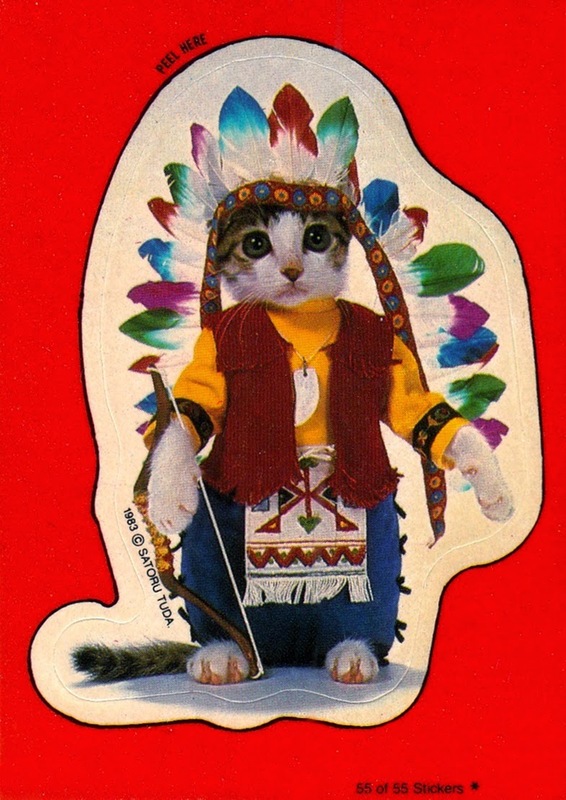 The online store Kruk Cards has these stickers! They sell the 8 card pack as well as the full 88 card set! They are hilarious!